And for Todd, in whom I find Allah every day. I found the dedication very sweet. How many authors dare dedicating their book to God! ... the most arresting thing about Tiel's work is that she dares to embrace the heart's overflowing imagination, and says "God" without flinching, longs for God or extols God in His creation and in every moment, without hesitation, as naturally as breathing. ... When Tiel says "God" she means it, in all her various ways and fresh poetic stratagems, in these poems in which there many strata, and in this book contains many gems. Most semitically "religious" poetry suffers from a kind of "I know what's coming" piety, an assumption of religiosity that lets the poet get away with poetic murder, in which we are told what we already know, but in verse, with no new or arresting vision, nor anything poignantly personal, which amounts in the end to a "religiously correct" sentimentality. Remembrance is the missing key. This poetry from elsewhere comes. they're written down from memory. rattling the windows, blowing open doors. a music-box to dance to when I dream at night. let my tears be rain in the wind. She captures beautifully, reading her poem as one can discover, like the poem 'Heartbraking Splendor' where she reaches the very heart felt intimacy in a way which almost seems unreachable to most. Her brilliant use of words and their arrangements enable the reader to enter that space. In her poems she also whispers rare intimacy of the natural world and help the reader enter into the words that unveil the mysteries. The poem, 'Winter Wood' belongs there. Often she offers different genre of metaphor, different kind of meaning for readers as she does in the poem, 'Fisherman Dragged to Death by 150 lb Catfish'. embodied in a chip of ice. embodied in a speck of dust? Sorrow is a gateway to Allah - so is joy. and both solitude and love are paths to Allah. Another poem, 'The Uninvited Guest' uses the much loved sufi metaphor of wine in such a delicate modern framing, truly an American sufi poem it turns out to be. This is Tiel's achievement, her contribution, is the recapturing of sufi bewildering and ecstasy in the most modern frame of reference without any hangover. Some poems resurrect the ancient sufi symbols in a totally new way, as we see in the poem, 'Journey' where she works with the seeker's journey metaphor. She will use the most common human experience of everyday living and turn it into a spontaneous song of praise as she did in 'Thank God for Sleep'. There is a tender sweetness in Tiel's poetry which makes these human eyes moist at times while reading her work. Her poems at times reactivate sufistic emotions and turn the reader into a weeping sufi. While reading her poem, 'Spiderweb' that was the state. As Ansari explains her thoughts behind the arrangement: "In the first section (At Home in the World), the soul is at rest and content with the things of the world, in the second section the soul learns sorrow, in the the third section the soul experiences change, then it learns to listen in the fourth section. ("Listening" refers to attentiveness.) In the fifth section the soul begins to journey, this is not a physical journey, but a journey towards deeper understanding. In the sixth section the soul learns that everything is illusion except for the ultimate reality of God, and in the seventh section the soul is again at rest, with the Beloved. The very first poem (Drinking from the Source) is by way of an introduction, it explains that I do not claim authorship of these poems as I believe poetry comes from Allah. The very last poem (Bitter Wells) is like a summary of the whole journey." Ansari's book is a good example of how passionate blogging can be turned into a wonderful book and a delightful reading experience. It also utilizing Lulu: a self publication, electronic publishing technology that gives authors the freedom to publish their content whether its book, cd, artwork etc. totally at ease. Read more about Lulu's features and how it works. The book is published under Ecstatic Exchange publications. From the cover design to its arrangement of poems - its a beautiful work. Tiel Aisha Ansari currently lives in Portland Oregon where she works for a public school district and also electronically at her poetry blog site Knocking from inside. 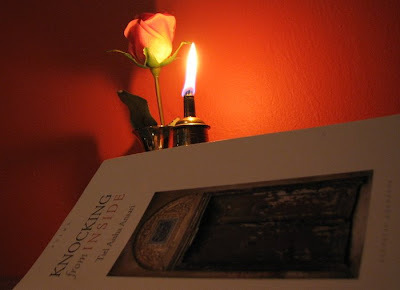 'Knocking from Inside' is also the featured book to celebrate at the 2nd Online Sufi Poetry Carnival coming up this 7th August. 'I can't now remember exactly when I became aware of Tiel Aisha Ansari as a presence in the poetry world, and specifically in the Muslim / Sufi poetry world, but her work has attracted my and others' attention by the suddenness of its authority and relevance. Her artfully "artless" poems with their lyrical moments, more extensive excursions, inner voyages and introspections, momentarily ecstatic realizations and visions, have consistently caught me up in their simplicity of style and limpid straightforwardness of expression. A young poet, in terms of years writing poems (only two by her account), Ansari gives fully at one with her voice, which loves brevity while digging quite deep in a relatively short space of poetic time. # Where to get your copy?